From Taipei, we will take the High Speed Rail to the Tainan station. From there, we will explore some of the sights important to Taiwan’s modern history, such as the Anping Fort from which the Dutch ruled Taiwan in the 17th century. We will also explore the Anping Treehouse, which was once a warehouse of a British trading company that has been taken over by banyan trees. 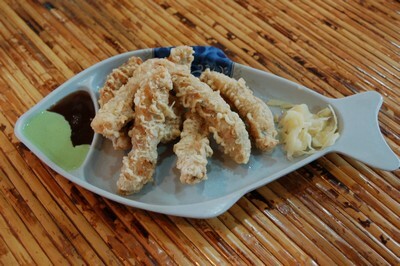 In the Anping Community, Taiwan’s first Han Chinese settlement, we will sample some of Tainan’s unique foods. 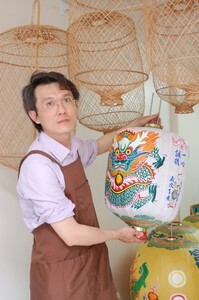 From there, we will visit traditional Han Chinese artisans who are creating traditional style works such as wooden furniture and paper lanterns. There are also mangrove forest and wetland ecosystems to be explored in Taiwan’s newest national park, Taijiang National Park. From Tainan, we will drive to the beach resort area of Kenting in Pingtung County and tour some of the area’s attractions. This will be followed by an afternoon free to enjoy the beach. 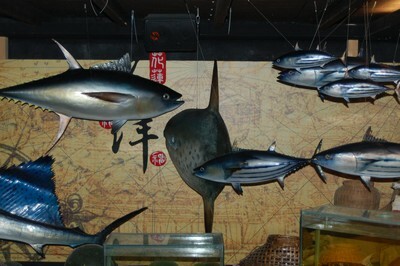 At night, the main street of Kenting comes alive with an outdoor market, pubs and restaurants. Today, we start our exploration of Taiwan’s indigenous culture and make our way to beautiful eastern Taiwan. First, we head to Mudan Township, which is home to the indigenous Paiwan tribe and visit an eco-park. 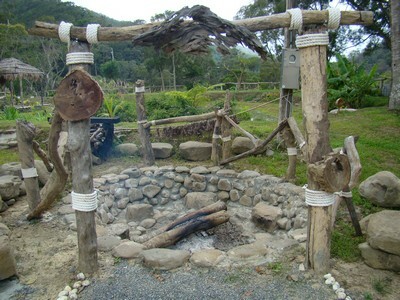 Here, we learn about the traditional plants used by the Paiwan tribe and enjoy a meal of organic food and herbal tea. Next to this park are a nature trail and river. Then, we head to Taitung City to an abandoned sugar refinery that has been transformed into an indigenous handicrafts center. 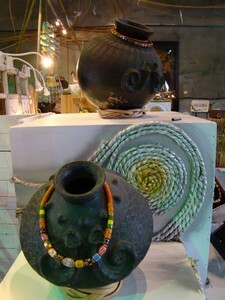 Here, we will have the chance to view locally produced handicrafts, such as the glass beads of the Paiwan tribe. You can even make your own bead as a unique souvenir of your trip. After dinner, we head to Tiehua Village, a live music venue. Artists and bands are mostly from Taiwan’s indigenous tribes or indie bands from Taipei. We explore the beautiful Taitung coastline with our first stop at the Jialulan Rest Area. 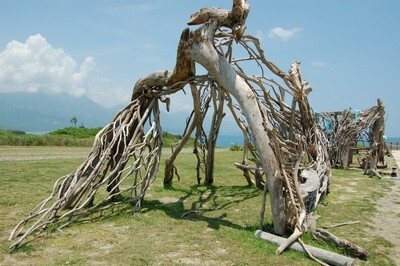 This is a park overlooking the Pacific Ocean that features a collection of locally produced driftwood art installations. From there, we head to the Xindong Sugar Refinery Culture Park in Dulan Village of Donghe Township. 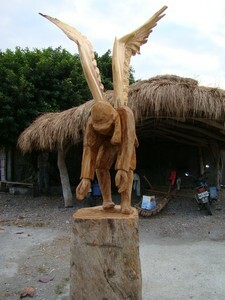 Here, we learn about the driftwood sculpting industry and other local handicrafts industries. Then, we explore more of Donghe Township which is a mecca for surfers around the world and visit a workshop run by an indigenous Amis woman. This workshop employs elderly persons from a local Amis village to produce hats and handbags from natural cotton and hemp. Lunch features fish caught off the shores and this is followed by a visit to an indigenous Amis fishing village. 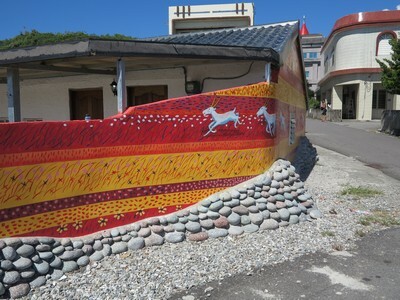 This once sleepy and poor community has become a successful cultural tourism destination due to its PawPaw drum ensemble, cultural center, renovation of neglected buildings to create guesthouses and artisan workshops, coastal beauty and collaboration with famous Taiwanese artists such as Jimi. We wind down the day by enjoying the last rays of sun over the coastal mountains in a locally run guesthouse in Changbin Township, the northernmost point of Taitung County. The first stop on this day is the Changbin Catholic Church. Father Josef Eugster is originally from Switzerland, but has served as a priest here for decades. He is affectionately known as Father Wu and has developed a reflexology system that has become famous all over Taiwan and Asia. He has passed on this knowledge to the local Amis residents who earn a living by providing reflexology foot massages. 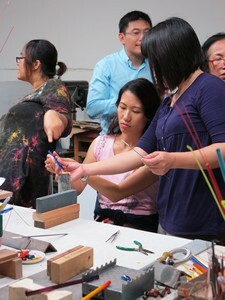 Then, we head to Dagangkou, an Amis village, to learn about their efforts to revive their coastal rice paddies and view works by local artisans. 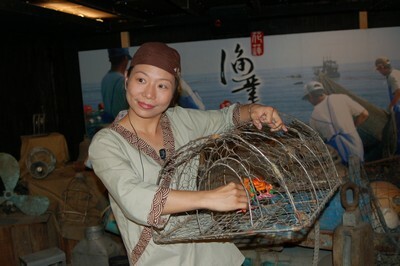 Our next stop is Cixingtan Beach, which is a net fishing area. Next to this beach is a museum devoted to introducing the area’s heyday as a wood fish (katsuo) product processor and exporter. On this day, we begin with a cultural tour of Xiulin Township, home to the Truku tribe. We visit a Truku community and a museum devoted to the disappearing tradition of facial tattooing. After our tour, we head to Swallows’ Grotto in the spectacular Taroko Gorge and visit Swallows’ Grotto to walk a narrow road through twisting tunnels that are favorite nesting places for swallows. This was once part of the main highway through Taroko National Park. It is also the point where the gorge is at its most narrow and the waters of the Liwu River are at their fastest, creating a vision of pure natural beauty. 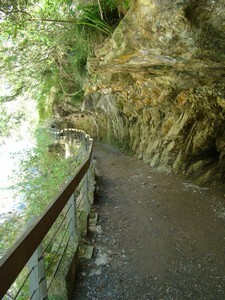 Before leaving Taroko Gorge, we hike the Shakadang Trail. Along this trail, members of the indigenous Truku tribe grow bird’s nest fern, an ingredient in indigenous cuisine, and the aquamarine waters of the Shakadang River flow. From there we head to an Atayal tribal community in Nanao Township of Yilan County to learn about this tribe’s weaving and hunting culture. We then return to Taipei via van along the Suhua Highway and through the Xueshan Tunnel (the fifth longest tunnel in the world measuring 12.6 kilometers) arriving at about 7:00 p.m. 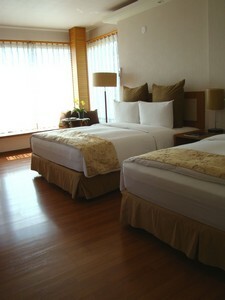 This large luxury hotel is conveniently located in central Tainan City. Next door is the FE21 Department Store offering a variety of shopping opportunities. Inside the hotel are a gift shop and shopping arcade, as well as fitness center, business center, outdoor swimming pool, spa and sauna. Although located in close proximity to Tainan’s night life venues, the hotel itself has two great places for socializing, the Lobby Lounge and Mezzanine Bar. Both offer live music performances. This large resort has nearly 200 rooms and is elegantly designed in Spanish style with red tiles and white walls. It offers an exotic holiday ambience that perfectly integrates into the spectacular natural surroundings of mountains and ocean. It is conveniently located far enough from the noise and traffic of Kenting Main Street but close enough to access the outdoor market, pubs and restaurants there. Amenities include a video game arcade, billards room, fitness center, karaoke, outdoor swimming pool, and spa center. Located in Taitung City, near the Taitung Fengnian Airport, this large resort is decorated in an indigenous theme including large wood carvings and a traditional fishing boat of the Yami tribe. Amenities include a saltwater swimming pool, hot springs pool, sauna, fitness center, video game arcade and billiards room. Sunny Buhouse is run by a couple who fell in love with the beauty of Changbin. They have created a place for sharing where people can teach and learn dance, yoga or other talents and techniques. 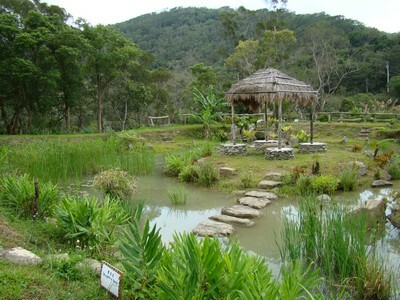 Outside are a pond filled with croaking frogs, a tree swing and a nature trail. 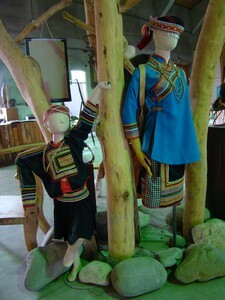 Inside, the first floor features large picture windows for taking in the coastal mountain landscapes plus an ethnic chic decor with wooden statues and indigenous wall hangings. At night, the roof is a good place for viewing the stars. In the morning, you are greeted with a homemade, healthy buffet breakfast with bread, jam, fruit, herbal tea and coffee. Silks Place Taroko is part of the Formosa International Hotel Corporation, under the Silks Hotel brand. 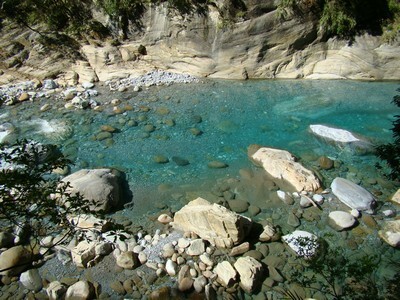 It is located within the boundaries of Taroko National Park. Silks Place Taroko is designed in the modern Chinese style and combines Taroko’s cultural and environmental characteristics. The four pillars on the hotel’s façade each measure nine meters in height and are made from sandstone from Shanxi Province of China. On these pillars are carved motifs of four of Taiwan’s indigenous tribes: Rukai, Tao, Puyuma and Amis. Tainan is often referred to as the “cradle of Taiwan’s modern history”. 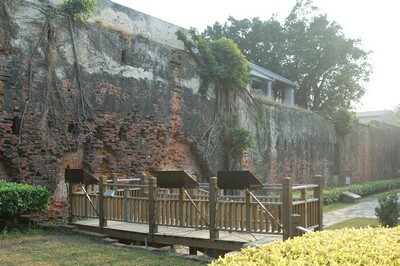 The Dutch East India Company ruled Taiwan from Fort Zeelandia, later renamed Anping Fort, from 1624 to 1662 when they were expelled by Koxinga, a Ming dynasty warlord. 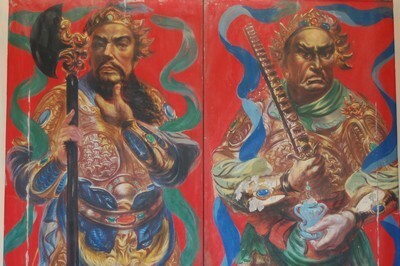 Following Koxinga’s victory, large numbers of Han Chinese immigrants came from the coastal areas of southern China, settling in Tainan around Anping Fort, known as the Anping settlement. Once called Fort Zeelandia, this was the headquarters of the Dutch East India Company on Taiwan, the territorial ruler of Taiwan from 1624 to 1662. This fort was located adjacent to a bay which was used to carry out trading activities. It is important to note that most of the fort is not the original, as it has been rebuilt more than once, and a white observation tower was constructed following World War II. However, outside the fort is a section of brick wall that was once part of the original Zeelandia. In addition, excavations have been underway around the fort for many years. These excavation pits are surrounded by walkways for public viewing and artifacts dating back to the Dutch occupation have been found. Located near the Anping Fort is a bright white building which was once the office of the Tait & Co. Merchant House founded by British traders in 1867. 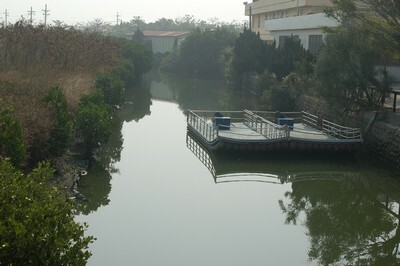 This was considered one of the top five foreign firms in Anping at that time. Near this building was the warehouse of this firm which was left neglected and taken over by the roots and branches of banyan trees. A series of pathways through the building and stairways above provide different perspectives of this now integrated building and banyan tree structure. 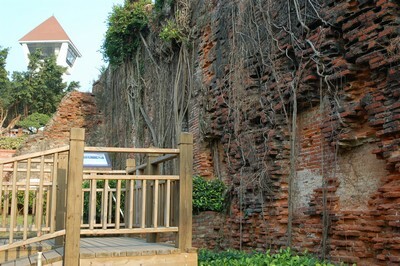 The small lanes in the community adjacent to the Anping Fort were once part of the first Han Chinese settlement in Taiwan. At first glance, the narrow streets appear to be a bustling marketplace with food stalls, simple eateries and shops selling a variety of souvenirs. But, if you look closer, you will notice that some of the walls that surround the courtyards of the old houses include coral, attesting to this area’s once close proximity to the water, as well as bricks that were taken from Fort Zeelandia. 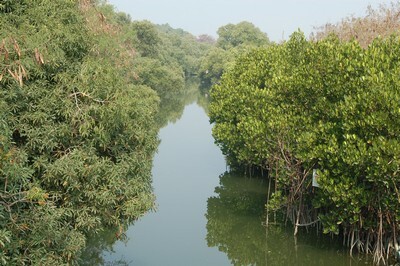 Located along Taiwan's southwest coastline with a total area of 34,405 hectares, Taijiang National Park is comprised of two international-class wetlands, the Zengwun Estuary Wetlands and the Sicao Wetlands, and two national-class wetlands, the Qigu Salt Field Wetland and the Yanshui Estuary Wetlands. Used for a long time as salt fields, harbors and fish farms, the Tainan costal area has preserved a vast expanse of precious wetland ecosystems and mangrove forest, which are a major habitat for rare birds such as the Black-faced Spoonbill. What was supposed to be an underground shopping mall became an abandoned street with partially demolished homes being torn down to make way for the construction. The remaining walls have been turned into canvases for local artists, graffiti artists and designers. Along this road are restaurants and pubs, making it a nightlife center. 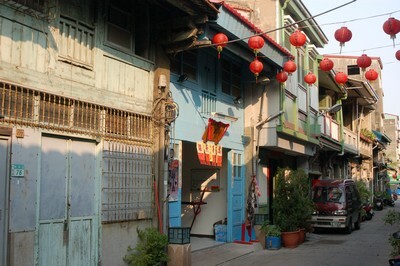 Off of Haian Road are small lanes with shops producing traditional crafts such as wood furniture and paper lanterns. Kenting located at the southern tip of Taiwan is the island’s premier beach resort area. However, this is also the location of Kenting National Park and Kenting National Forest Recreation Area, both of which are focused on preserving coastal forest. 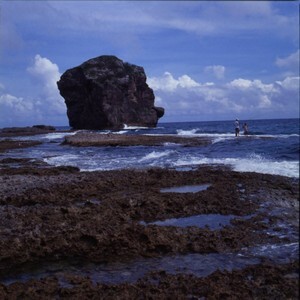 The national park also preserves coral reef areas. 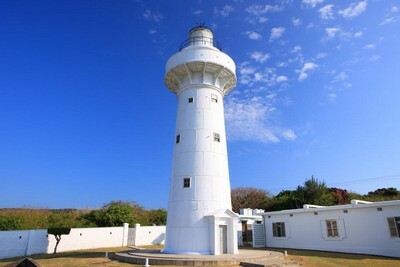 In addition to the beach and coastal forest landscapes, attractions include the Eluanbi Lighthouse. This lighthouse was built in 1882 to try and reduce the number of shipwrecks in the area. Due to frequent incursions by the local indigenous population, this is one of the few examples of an armed lighthouse in the world. Mudan Township is nestled between Pingtung and Taitung counties with mountain and coastal scenery, as well as hot springs and indigenous Paiwan culture. There are also a plethora of wild flowers that bloom throughout the year, such as peonies and white ginger lilies. Part of the indigenous Paiwan tribe’s traditional knowledge includes that of plants. Here, plants traditionally used by this tribe are grown and introduced to visitors. This eco-park has received organic certification and serves meals created using the plants grown here, as well as herbal teas. 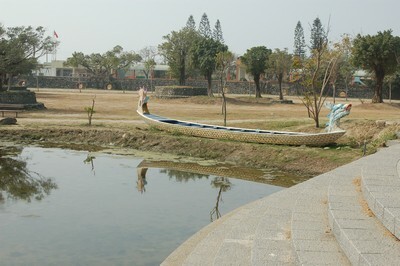 Visitors can also enjoy a leisurely walk along a nature trail or enjoy the cool, clear waters of the neighboring river. Sugar processing was once an important industry in Taiwan. But, when the demand for sugar dropped, many of Taiwan’s once booming sugar refineries closed. Instead of allowing the buildings to fall into neglect, the ones at this refinery have been turned into exhibition space. 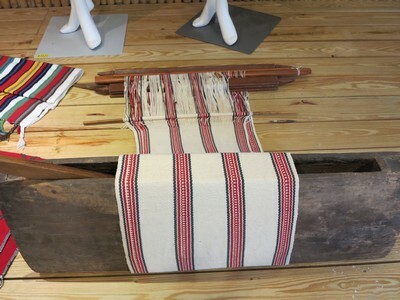 In one of the buildings, handicrafts from local studios are on display and for sale. This is also the work space of the Ata Beads Studio, which promotes and preserves the glass bead culture of the Paiwan tribe. This is a live performance venue for mostly indigenous artisans. The indoor performance area has a stage and tables and chairs. 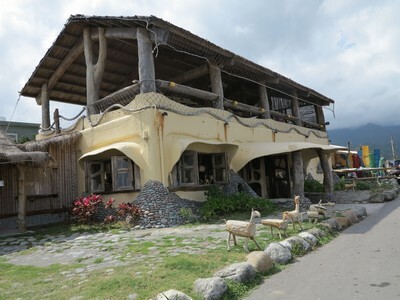 It is housed in one of the few remaining Japanese occupation era (1895-1945) buildings in Taitung City. 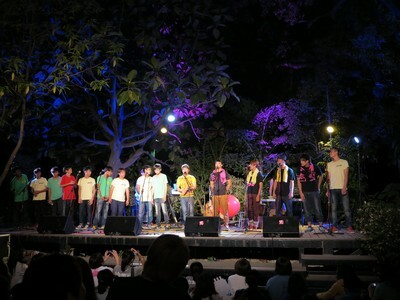 However, most of the performances are held on the outdoor stage. 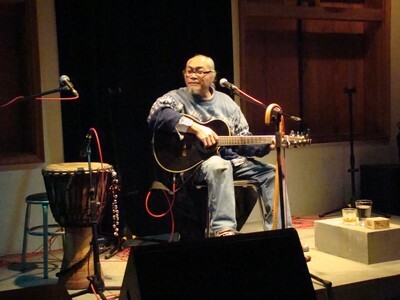 There is a good variety of music including traditional, folk, blues, rock and reggae. Artists that play here include those that are well known and those that are up-and-coming. 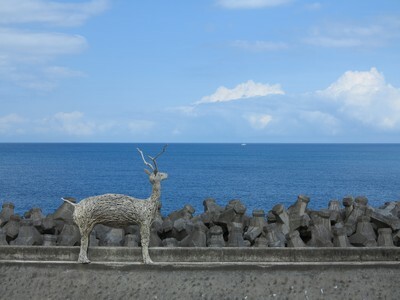 Taitung County boasts the longest coastline, nearly 200 kilometers, of any county in Taiwan. Unfortunately much of the coastline is rocky, but there are several pleasant beach areas for swimming in the summer and surfing in the fall and winter in Donghe Township. Every November, the Taiwan Open of Surfing is held in Taitung at the Jinzun Fishery Harbor. Much of the coastal area is home to the Amis tribe. 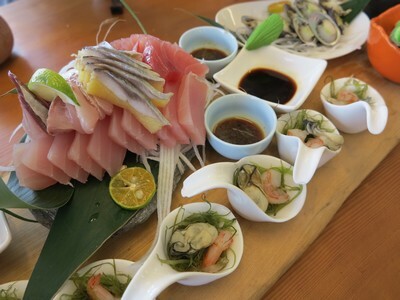 The coast also has several fishing harbors, and fresh seafood is the local specialty. This was once an active sugar refinery. However, as demand for sugar slowed, this refinery fell out of use. The original buildings were turned into artist studios, exhibition space, performance space and restaurants. The original smokestack was left intact and now serves as a Dulan landmark. 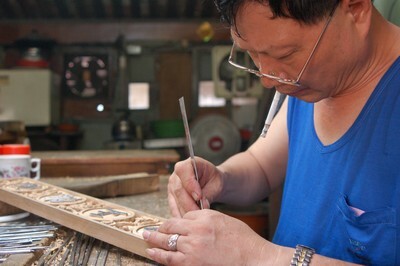 One of the artists-in-residence is Amis woodcarver Siki Suphing who is from Dulan Village. 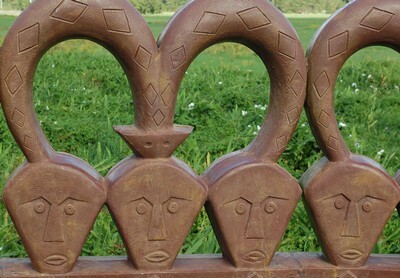 His works are based on his culture including hunting, gathering of food and important ceremonies, as well as the legends told to him by the village elders. 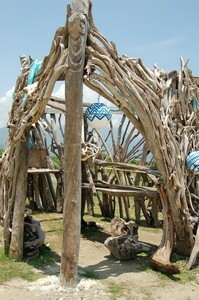 Many of his works are produced using locally obtained driftwood. From the outside, this is a small, non-descript workshop. But, once you enter, you will be treated to the sight of truly unique handmade products produced from cotton and hemp, as well as other natural materials. 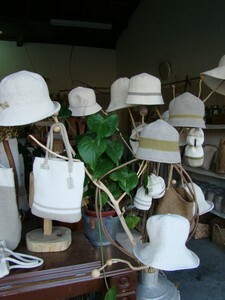 Products include hats, handbags and clothing. All of the products are crocheted or woven by hand by mostly elderly people living in the adjacent indigenous Amis community, which provides them with a source of income. Taiwanese fashion designer Jamei Chen is working with Mianmawu to develop its products and to increase its marketing channels. In the Amis language, Pisiliang and PawPaw mean “a place for raising goats” and “buoy”, respectively. The PawPaw is used by the indigenous people to stabilize fishing nets. When the worn-out PawPaws were ready to be replaced a few years ago, the head of the community development association, Ms Chun-Mei Chen, invited an artist, Mr. Zhi-Ming Fang, to come up with a creative way to integrate traditional weaving, patterns, colors and carvings to transform old buoys into uniquely styled drums. 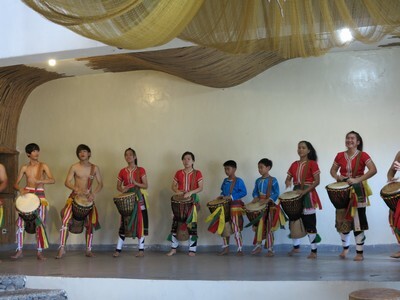 In March 2009, Mr. Tzong-Ching Chu, also known as the founder of the famous percussion ensemble that bears his name came to the community to attend a PawPaw drum performance. Mr. Chu was very impressed with the talent of the young students and immediately assigned Mr. Hong-Chi He, his chief deputy in the ensemble, to serve as the instructor for the band. In May 2009, Mr. He started intensive training, twice per month, based on world-class music performance standards, and the result has been amazing progress made by the band members. The success of the PawPaw drum band has instilled new hope and life to a declining community. The impact is especially significant on the young people who make their own instruments and are proud to be band members. The PawPaw drum brings the community together and has become part of the identity of Pisiliang. 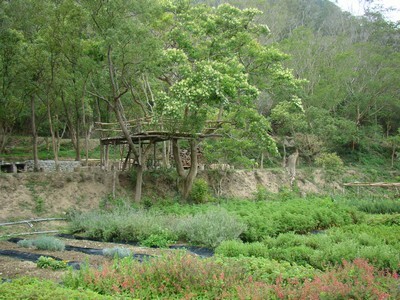 Changbin Township is a favored destination for those wanting to get away from it all. The main attractions here are sleepy fishing villages and coastal scenery. 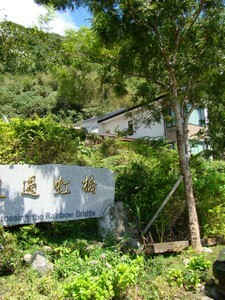 There are several guesthouses, many of them quite luxurious, nestled among the coastal mountain slopes. In the daytime, there are spectacular panoramic views of the mountains and ocean and at night star-filled sky. This is a local heritage site. This small, quaint church was established in the 1950s, by a group of Swiss youth. The Changbin Parish, which has now served Taitung for sixty-odd years, is currently headed by Father Josef Eugster. Father Eugster is not only fluent in Taiwanese, Chinese and Amis, he is also a pioneer in the field of foot reflexology and uses massage techniques as part of his ministry. This is an indigenous Amis community. Influenced by Han Chinese settlers, this community began growing rice in coastal paddies. However, three or four decades ago, rice growing began to decline and the paddies became overgrown. In recent years, the community has been working to restore the traditional irrigation system and to once again grow rice. 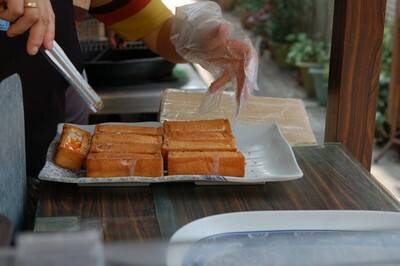 The local rice is sold at the Mimi’an Café, which also offers coffee and tea and promotes wood carving and other handicrafts produced by local residents. 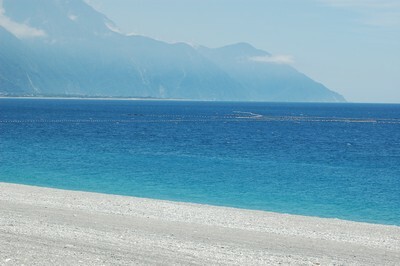 Xiulin Township is located in the northern part of Hualien County between the coast and the mountains. 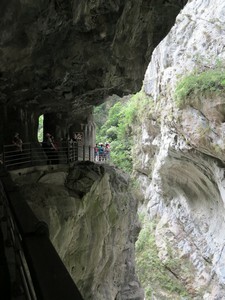 It is home to the spectacular Taroko Gorge, one of Taiwan’s most popular tourist destinations. Although Taroko National Park is within an area rich in indigenous culture and history, this does not become evident until you explore the surrounding communities. 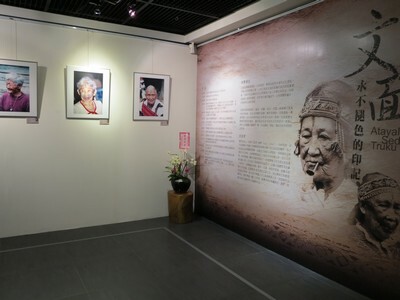 For example, the Taiwanese Aborigine Tattoo Culture Museum provides information about the facial tattooing traditions of the Atayal, Sediq and Truku tribes. This practice was forcibly discontinued by the Japanese during their occupation of Taiwan (1895-1945). Kimi Sibal, a member of the indigenous Sediq tribe, has devoted much of the last two decades to preserving the remnants of the facial tattooing traditions by photographing the elders who were tattooed before the tradition disappeared. 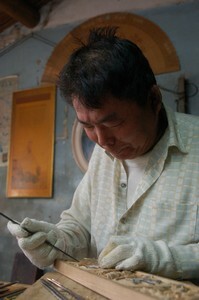 Kimi founded this museum to display his photographs, as well as historical items such as traditional tattooing tools. The Eternal Spring Shrine commemorates those who lost their lives in the building of the highway that runs through Taroko Gorge (1956-1960). This is a picturesque shrine built above the Eternal Spring Waterfall. This is a mostly indigenous Atayal area. It is in a picturesque mountain setting, providing many ecotourism opportunities. In addition, the residents here are working to preserve many aspects of Atayal culture such as cloth weaving, rattan weaving and hunting. With a population of more than 140,000, the Amis is by far the largest of Taiwan's officially recognized indigenous tribes. 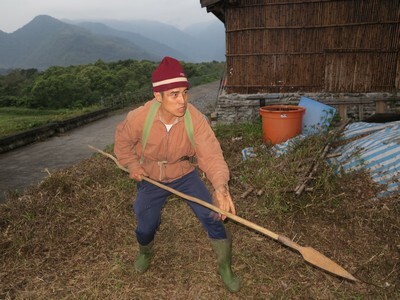 The mountains and coast of Hualien to Taitung are where this tribe is concentrated. Traditionally, the Amis possessed a matrilineal society. Women inherited the family property and children were named according to their mother's name. Although women were responsible for the major decisions in their individual households, the political decisions of the village were made by men, with division of labor based on a strict age organization. The Harvest Festival is held in July and August to celebrate the harvest of millet, a traditional staple grain. 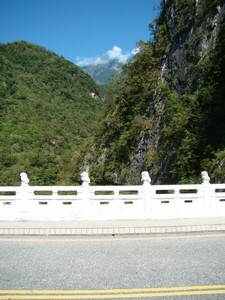 This tribe originally inhabited Nantou County, but as its population grew it moved into what is today Taroko National Park in Hualien County. 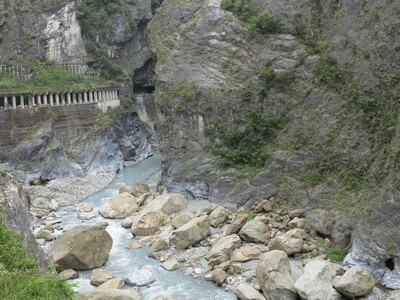 The highway that cuts through Taroko Gorge was expanded from a Truku tribe hunting trail. However, in the early 20th century, the Truku tribe was forced to move out of this gorge by the occupying Japanese forces. This tribe is still concentrated in villages surrounding Taroko National Park. As with the Atayal and Sediq tribes, the Truku tribe practiced facial tattooing.